The Nobel Prize winner also told Dutch television that Mr Mugabe should be removed by force if he refuses to go. On Thursday, Kenya's Prime Minister Raila Odinga said African governments should oust Zimbabwe's leader. 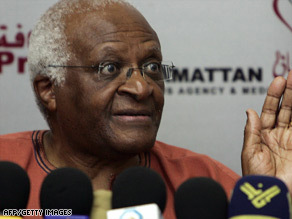 Archbishop Tutu said Mr Mugabe had ruined "a wonderful country", turning a "bread-basket" into a "basket case". US Secretary of State Condoleezza Rice has said it is "well past time" for Mr Mugabe to go, saying a "sham election" has been followed by a "sham process of power-sharing talks". Zimbabwe has declared a national emergency over the cholera outbreak, which has killed at least 565 people - the most deadly in the country's history. Health workers say the collapse of the health systems and the water supply in the capital, Harare, are major reasons why the epidemic has killed so many people. Mr Mugabe and opposition leader Morgan Tsvangirai agreed to share power in September to tackle the country's economic meltdown but they have been unable to agree on the allocation of cabinet posts. The deadlocked agreement followed disputed elections, which both men claimed to have won. Archbishop Tutu told the Dutch TV programme Nova: "I think now that the world must say: 'You have been responsible, with your cohorts... for gross violations, and you are going to face indictment in The Hague unless you step down.'" Mr Tsvangirai says his supporters were the victims of a state-sponsored campaign of violence which left at least 200 dead and forced many thousands from their homes. "If this is not evidence to the international community to stand up for what is right, I don't know what would be. And frankly the nations of the region have to do it." African leaders have generally refrained from criticising Mr Mugabe in public. Although this is now starting to change, the BBC's Jonah Fisher in Johannesburg says there is no real sign that Mr Mugabe is about to be forced from power. Mr Mugabe has meanwhile blamed Mr Tsvangirai's Movement for Democratic Change for the power-sharing impasse. "The MDC should say no if they do not want to be part of the inclusive government," he was quoted as saying by the state-owned Herald newspaper. Both the South African and Mozambican authorities are on alert in case the cholera epidemic spreads outside Zimbabwe. South Africa says it will send a team of senior officials to Zimbabwe next week to see what assistance can be given. As well as the cholera outbreak, up to half of the population - five million people - will need food aid in the coming months, donors say. Zimbabwe has the world's highest annual rate of inflation - 231,000,000% - and just one in ten adults are believed to have regular jobs. Dr John Sentamu, writing in The Observer, said the world must recognise that the time for talks was over and Mugabe should be forced out. 'The time has come for Robert Mugabe to answer for his crimes against humanity, against his countrymen and women and for justice to be done. The winds of change that once brought hope to Zimbabwe and its neighbours have become a hurricane of destruction, with the outbreak of cholera, destitution, starvation and systemic abuse of power by the state,' he says. He said the power-sharing deal signed by Mugabe and the Zimbabwean opposition in September was 'now dead'. This time last year Sentamu, one of the Anglican church's most senior clerics, ripped up his dog collar on television in protest at Mugabe's regime and refused to wear one again until the tyrant had been toppled. He then asked Christmas shoppers to give £1 to Zimbabwe's suffering people, but now he wants more far-reaching action. The Archbishop's attack came as Gordon Brown also stepped up the rhetoric yesterday, calling the Zimbabwean government a 'blood-stained regime' and urging the international community to tell Mugabe 'enough is enough'. The Prime Minister said food shortages and the cholera epidemic had become an 'international rather than a national emergency' that demanded a co-ordinated response. South African Nobel Peace Prize laureate Archbishop Desmond Tutu said on Dutch TV that Mugabe must stand down or be removed 'by force'. But while Kenyan Prime Minister Raila Odinga has said it was time for African governments to 'take decisive action to push him out of power', there has been little sign that Zimbabwe's neighbours were prepared to move against him. The growing international fury came as cholera ravaged the people - 575 have died and 13,000 are infected - and the economy is worse than anything the world has seen. Inflation is at 231,000,000 per cent and the Reserve Bank has been unable to print money fast enough to keep up with prices, which double every 24 hours.